"Pilar and I have decided to end our marriage and move on to the next phase of our individual lives with mutual respect," he writes. Deion and Pilar Sanders at the 2007 NBA All-Star Game in Las Vegas. You may have seen former Dallas Cowboy and NFL Hall of Famer Deion Sanders hosting the pregame show for his old team against the Tampa Bay Buccaneers, but as soon as he was cleared from the air he announced he's getting a divorce via Facebook. Half an hour later Sanders "liked" a link from TMZ with an "exclusive" that Sanders told TMZ he was was divorcing his wife, though the quotes appear to be those of his Facebook post. There were rumors the couple was headed for divorce in late September but Deion Sanders came out with a strongly worded denial. You may remember Pilar Sanders was one of six wives and girlfriends featured on the VH1 reality show Football Wives last fall and in 2008 the couple appeared on their own reality show on Oxygen called Deion & Pilar: PrimeTime Love. 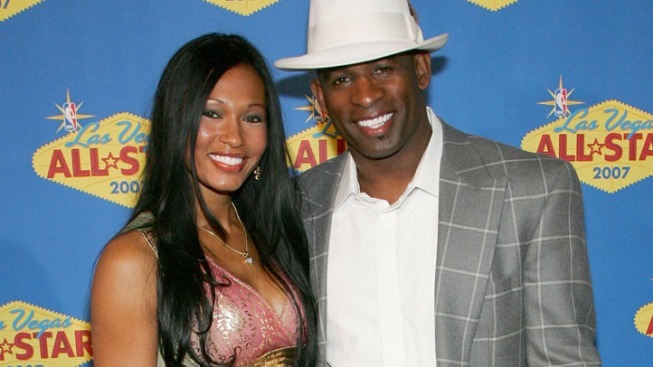 Deion and Pilar Sanders have been married for twelve years and have three children together. The couple have a 30,000 sq ft home on 100 acres in Prosper, 35 miles north of Dallas.